Up and walked Mix. The day dawned glorious – I have turned over in my mind whether that should be gloriously but have come to the conclusion that glorious is correct. If the day had dawned gloriously that would be a comment on how the day dawned but what I want to express is that when day dawned, the day that dawned was glorious. So now you know – and what is more important is that you catch an idea of how beautiful everything is today. The sun is shining the colours are bright, and Mum spent all morning outside either pottering in the garden or sitting in her seat. 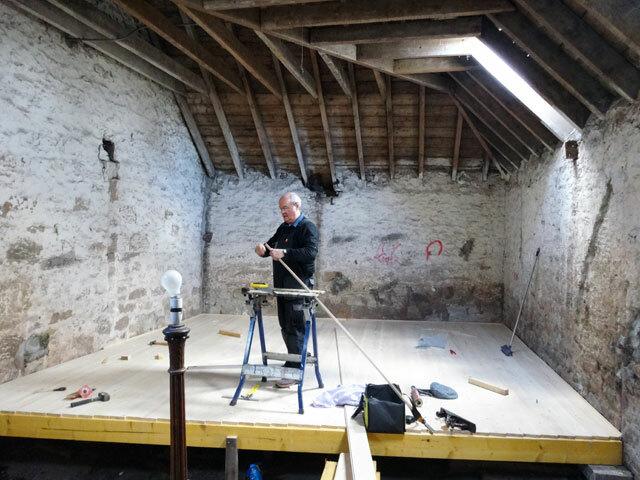 Tom and I started work on fitting the flooring onto the beams in the big barn. We had done much of the basic work by lunch time when we went off to Pearson’s to collect some more supplies and to have lunch (leek and potato soup followed by Macaroni cheese, washed down with Ginger Beer). Working through the afternoon we got the floor totally completed by stopping time. Rachel, who had been out at Duns for much of the day, was going to varnish the floor but that has been put off until tomorrow because instead we had an early supper and then drove into Duns with Mum to attend a Monday in Holy Week Service (there isn’t one here). I enjoyed the service (it was in the Anglican Parish Church but was based on a Norwegian Lutheran Communion Service), after which we came home and watched a bit of television (episodes two and three of The Killing with Mum and Olive) before walking Mix and retiring for the night. It has been a great day and the sunshine made it even greater.